Preschool is child care for children ranging from toddler to 4 years of age. VPK is a state-supplemented pre-kindergarten program for children who are 4 years old (or will be 4 years old by 9/1/2018). 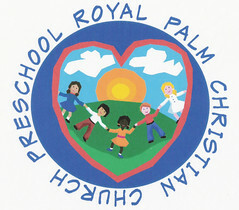 Our VPK program is state certified and monitored by the Early Learning Coalition of Broward County. Children enrolling in toddler class must be 12 months old and a steady walker. Children enrolling in 2 year old class must be 2 by 9/1/18. Children enrolling in 3 year old class must be 3 by 9/1/18. *Registration fee for ALL SCHEDULES is $150.00. *Fees based in a 180 day school year (not the number of days in a month). Clubhouse: (Mornings: 7:00am – 9:00am) (Afternoons: 12:00pm – 3:00pm) Clubhouse cost is charged at $4.00 per half hour. Late pick up fee applies unless prior arrangements have been made for care. There is a 10% discount for siblings and for church members who have been members for 6 months or more. Once you have turned in your registration and fee, you will be required to submit a Florida health forms #3040 and #680, before beginning school. ***Registration fee is not refundable. ***Monthly tuition is payable on the 1st day of each month. A late fee of $25.00 will be assessed if tuition is not paid by the 5th of the month. Weekly fees are due by Friday of the previous week of care. A late fee of $25.00 will be assessed if tuition is not paid by closing on Monday. Age Requirements: Children enrolling in 4 year old class must be 4 on or before 9/1/2018. Any child enrolling in a 4 year old class must be potty trained. Clubhouse cost is charged at $4.00 per half hour. Late pick up fee applies unless prior arrangements have been made for care. *Registration fee is not refundable. *Monthly tuition is payable on the 1st day of each month. A late fee of $25.00 will be assessed if tuition is not paid by the 5th of the month. Weekly fees are due by Friday of the previous week of care. A late fee of $25.00 will be assessed if tuition is not paid by closing on Monday.